Easily deliver polished, professional masters. Developed by Brainworx, and based on a complete chain of field-proven, high-end, professional analog mastering processors, the bx_masterdesk plug-in provides a fully featured mastering environment in a single plug-in that’s as easy to use as it is powerful. Whether you’re in the rehearsal room quickly polishing a reference track, or a professional engineer delivering masters to record labels, the bx_masterdesk plug-in offers a complete, intuitive mastering processing chain. Mastering requires a balanced, highly tuned processing chain, which can be both complex and expensive. 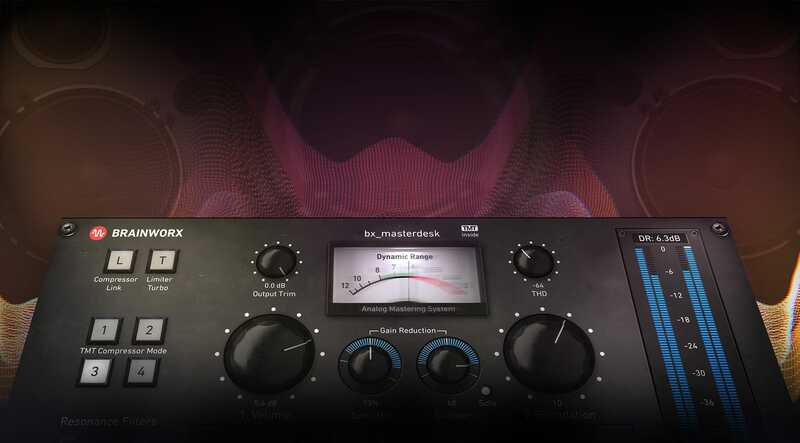 The bx_masterdesk plug-in takes much of the guesswork out of the mastering process by combining several parameters into single controls with carefully chosen individual audio processors, each pre-tuned for easy and effective results. The bx_masterdesk’s compressor section makes it easy to add energy to your masters without any pumping or unwanted artifacts. Inspired by classic designs, but transformed for the needs of modern DAW production, the compressor section features four different operating modes, each with its own attack and release rate for quick parallel compression textures. The EQ section of the bx_masterdesk plug-in lets you dial in broad stroke tonal adjustments using an intuitive control set that resembles a guitar amp's tone stack. Simply turn the Bass, Mid, Treble, and Presence knobs to quickly and subtly tweak the EQ curve of your master. For final seasoning, the bx_masterdesk plug-in sports two resonant filters, perfect for cleaning up low-end rumble and taming harsh transients. The bx_masterdesk’s precision metering will ensure your levels are always correct, while Brainworx’s renowned M/S processing lets you artfully shape the width of your masters. Excellent !! Best plugin for mastering !! Fine respondings, best feedback for every need !! During the production process, there are a many pre listen mixes for custumers to fix. For this kind of application you get the max result in quick time. Quick, easy way to master your mix. The EQ is lacking, but just us another EQ along with it. I really can't understand all this hype on this plug in. Find it pretty boring, specially for the price. I really regret buying it. During the production process, there are a many pre listen mixes for custumers to fix. For this kind of application you get the max result in quick time. This Plugin is a very helpfill Tool for fast Mastering. If i complete the Mix and my Customer won´t get a professional Mastering Engineer, i can do it for them in a short time with impressive results. It helps to minimize the costs for my customer a they will com back for further recordings. That´s good for my business. I regret choosing this plugin as the third one in the 3-bundle. It offers limited (better said no whatsoever) controls, arbitrary filters (6666 seriously? (: ) more-than-useless metering, oh, and did I mention LIMITED controls? Bass EQ? On what freq, how many dbs, what q number? Yeah you can find it buried in the manual, but it is useless. For a pro user it is a joke for a serious mixdown on the master bus, for a novice it might be wow at first glance, but will find out soon that it is well overpriced for what it offers. I know, it is my bad, I should have tried it as a trial version, and I really regret it not doing so. For that price, choose a Fairchild, a good EQ, or, well, anything else but this one. I have chosen this to be the third plugin in the 3-bundle, and I regret it. I know, my bad I haven't tried it the trial version, but the videos on it seemed convincing. If you are a pro mixer, producer, this plugin, with limited controls, arbitrary filters (6666, seriously? (: ) and, oh did I mention LIMITED controls? Or better say, none, whatsoever. For a novice user on the mixbus it might be wow at first glace, but unusable for a serious mixdown. I'd suggest for that amount of money choose a Fairchild bundle, a better EQ, or, better said, anything else, but not this plugin. Would love to return it and choose something else instead. This can really bring life to a mix. Glad I bought it! You can get a great sound going for your mix really quickly with this plugin. Subtle differences between the four modes...can inspire you to seek out a sonic signature that maybe you weren't thinking of. Really, really good. Fun to use. Finally, I can mix a song and master it EXACTLY the way I want it. Also...This plugin is perfect to get an idea of what your mix will sound like mastered, so it is a PERFECT reference for making sure your mix is where it needs to be, BEFORE Mastering. LOVE IT! Really. Ozone destroys my CPU and requires a lot of tweaking. This plug in just works. Scarily well. I had originally demoed this for a dance mix I did and now it's on everything... Easy user interface and hard to mess up. Like the title says, I might just be willing to trade all my other plugins for this one. In the past I would try to get stuff up to minus 9 db, and it was a challenge trying not to negatively impact the sound. Now, I can cruise up to minus 7, and it still sounds like an actual improvement! Way too cool. Of course I'm a little overdue in buying something dedicated to this specific purpose, and could a similar product make me this happy? Not likely . based on any of the youtube videos I've watched. Amazing Presets, amazing sound, many ways to colour up your mix! Mastering very dynamic and smooth til heavy-loud! Great again,UA! Sounds superb on everything, and brilliant on a drum buss too!